On the Shipping Club’s recent joint outing to Windermere, myself and two other members had the good fortune to share a table for lunch with a lovely couple from the Liverpool party. I think parts of the ensuing conversation are well worth recording. We were sitting awaiting the arrival of our friends from the Anchorage Club. As they entered; we beckoned to this lady and gentleman and invited them to join us – assuring them that all three of us were fluent in ‘Scouse’. That seemed to do the trick, they promptly sat down and introduced themselves as Joyce and Jim to which I replied that we were John…, George…, and before I could say Brian, Joyce quickly remarked ‘And you must be Ringo!’- After that there wasn’t a dull moment throughout lunch and until we departed for our trip on the lake steamer. It wasn’t long before the conversation turned to ships and the sea. 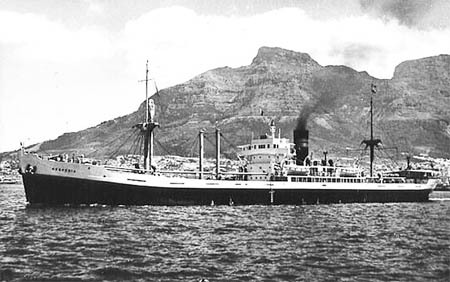 Jim had joined Clan Line as a junior engineer in 1947 and his first ship was the ‘Hesperia’ one of Clan Houston Line vessels. I was quite taken aback and told Jim that he and I must have slept in the same bed! Albeit ten years apart mind you! I too had joined the Clan Line as a junior engineer in January 1957 and the first ship I actually sailed on was the ‘Hesperia’. Fancy crossing paths with someone after more than half a century that was a complete stranger, yet felt like an old shipmate in a strange sort of way – strange bedfellows indeed! For those who are ship-nuts like myself, the ‘Hesperia’ was a type ‘D’ Empire Boat launched in January 1946 by Bartram & Sons of Sunderland as the ‘Empire Southwold’ for the Ministry of War Transport. She was purchased almost immediately by Clan Line and given the name ‘Hesperia’ Machinery was a triple expansion steam engine of 2500 IHP, manufactured by the North Eastern Marine Engineering Company of Sunderland which was right next to the Bartram yard and was in fact where I served my apprenticeship. From T.A.S.C. member Brian Smith. ← It’s all in the language!